Welcome to part 1 of our new series, Snapchat Influencer Q&A where you can learn from the masters as we deconstruct the techniques and strategies used by Snapchat influencers. Our first interview is with Erica Blair. Erica is a digital marketer who works remotely as a digital nomad. She also runs the Facebook group, Snapchat Marketing Mastermind which is a place where Snapchat marketers can connect and discuss the platform. 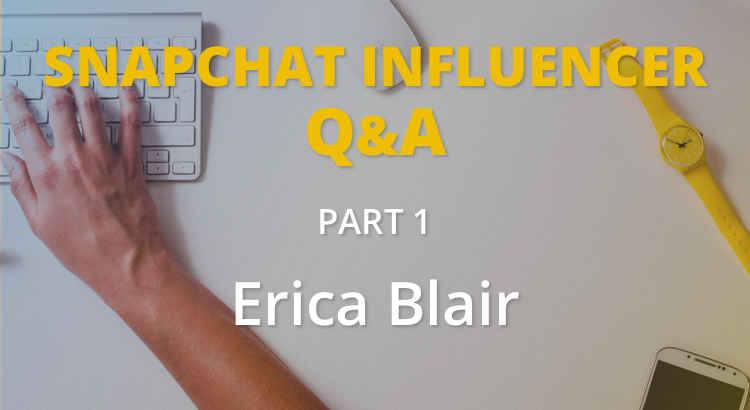 In this interview you will find out the impact that Snapchat has had on Erica’s personal brand and how you can use the platform to grow yours, the inspiration behind Snapchat Marketing Mastermind and why Snapchat marketing requires a different approach than other social media campaigns. Q: Hey Erica, great to meet you! Could you tell us a bit about yourself and what you do? I’m a digital marketing strategist for small businesses. I work with solopreneurs and small organizations to determine the best uses of marketing resources, so that they can create generate the biggest return with limited time, energy, and money. I love working with small, nimble, forward-thinking businesses who are excited to make a splash in the world, but who need a helping hand determining how exactly they can expand their impact. I’ve been working one-on-one with clients for several years to develop marketing strategies and design content suited to their particular business. I offer personalized strategies based on the unique nature of each business, and at the moment I am also preparing to launch training materials designed to help clients who want to implement my strategies on their own. Q: When did you realise the potential of snapchat for business and when did you get serious about it? I first tried Snapchat in 2013, before the launch of stories, and I didn’t see the value for business at that time, so I quickly abandoned notions of it being a marketing platform. 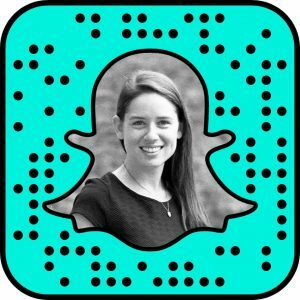 I revisited Snapchat in early 2016 simply as part of due diligence, since my ability to advise clients depends on having a current understanding of the platforms and their myriad uses. I didn’t expect that I would enjoy using it so much, or that it would end up becoming the platform upon which I built my personal brand, but I quickly saw the immense opportunity of this precise moment in Snapchat’s history. In March 2016, I decided to go all in on Snapchat, and I began building my audience there shortly before the Chat 2.0 launch. The Facebook group that I started, Snapchat Marketing Mastermind, was born slightly thereafter. I had noticed a lack of places for Snapchatters to gather together and discuss the platform in a group setting. So much of Snapchat occurs on a one-to-one basis, and I wanted to create a place for the growing tribe of marketers and businesspeople using Snapchat to gather, share their experiences, and trade tips. So far interest has far exceeded my expectations, and we seem to be growing by leaps and bounds every single day. It’s become a fabulous place to connect with other people who are looking to use Snapchat to help grow their business, and to connect with potential collaborators and clients in a wide variety of fields. Q: What impact has Snapchat had on your business/personal brand? I fully believe that Snapchat is one of the greatest professional networking platforms of our time. For me, Snapchat has helped to bridge the gap between my personal and professional lives, which allows me to present myself as a complete person to potential friends, clients, and collaborators. On Snapchat, I show the full spectrum of my life, sharing insights related to business and digital marketing as well as glimpses into what an average day looks like for me. As a result, Snapchat has allowed me to build more authentic relationships than any other social media network, because the people I connect with on Snapchat know me as a real person with a full life that includes more than just digital marketing. Thus, the connections I create on Snapchat are built on a foundation of friendship and mutual understanding, rather than on some glamourized or polished image of what my life is like. Over the last several months, I have made numerous connections with people who sought my advice and expertise in order to supercharge their own marketing strategies. Additionally, I’ve developed friendships with a large number of people who also do digital marketing and business strategy, which has provided the opportunity to swap ideas, share experiences, and plot collaborations. The result is that I’ve been asked to participate in online panel discussions, moderate Twitter chats, do Snapchat account takeovers, contribute to blog posts, and add value to a number of other collaborations, all of which have allowed me to grow my audience and create meaningful connections with amazing, intelligent people around the world. Your audience and network will only be as strong as the relationships you grow there. And although you post content to a story, in many ways Snapchat has remained a peer-to-peer messaging app at its core. You cannot use Snapchat solely as a distribution channel and expect business results; you have to engage individually and meaningfully with each and every person who you come across. If you’re not willing to commit the time it takes to grow relationships, then it will be very difficult to find any value in Snapchat as a marketing platform. From a more tactical perspective this means that when you’re starting out, it’s especially important to make time to reach out to all the new people who add you, in order to create relationships and lay the foundation for long-term friendships. Understand and make use of the various messaging options within the chat side of Snapchat—in addition to snaps and text messages, there are also audio and video bubbles, which can be extremely useful in streamlining responses once your audience and engagement grows. Share screenshottable snaps designed to drive your Snapchat audience to your blog articles, use strategic posts and snapcode shares to move your Twitter followers onto your Snapchat, engage in Snapchat-related Facebook groups, and so on. Snapchat is just one of the various tools for growing connections, and although it’s one of the best networks out there for building a devoted tribe, business results will only come about if you’re able to inspire that group of people to take action elsewhere. Q: What are your plans for your Facebook group, Snapchat Marketing Mastermind? Snapchat Marketing Mastermind is a Facebook group designed to be a gathering place for anyone who is using Snapchat to promote their business or personal brand. It’s by far the largest Facebook group dedicated to the topic of Snapchat marketing, and has become a real hub for discussion of Snapchat for business in general. I started it because I wanted to provide a space for my peers, both digital marketers and small business owners, to come together and trade perspectives on the tactics and strategies that give rise to effective Snapchat marketing. At the time, there weren’t many resources available for people trying their hand at Snapchat marketing, and I was looking for the opportunity to swap ideas with others who were embarking down the path of Snapchat marketing. I had seen the power of Facebook groups as a space for valuable discussion of business topics in general, I felt that Snapchat marketing deserved the kind of elevated conversation that existed around other social media networks. On April 5, 2016, Snapchat Marketing Mastermind was born. It’s a very community-centric group and I think it will evolve naturally as the community of Snapchat marketers grows bigger and stronger. I believe strongly that the power of many far exceeds the power of one, and as such I have actively sought to create a group that involves community-wide discussion where everyone can feel free to contribute their perspective. In terms of the future, because Snapchat marketing is still a very new topic, I predict that we will be seeing a huge influx of people who are trying their hand at Snapchat marketing for the very first time. I am looking to compile some community-driven resources for Snapchat Marketing Mastermind members that will provide a starting point for people who are new to Snapchat as a marketing platform. At the same time, the group has included Snapchat heavyweights since its earliest days, and I think it’s important to maintain a place where people at all stages in their Snapchat marketing can come to find value. Snapchat is a platform built on relationships, and I feel honored to have been able to create a community that helps to expand and strengthen the relationships between businesspeople who are harnessing the power of this amazing platform. Snapchat is a platform that takes the common approach to social media marketing and completely flips it on its head, which is why it can seem difficult and counter-intuitive to people just starting out. With Snapchat, value is found far more in the level of engagement and depth of relationships that the platform can breed. For people just starting out using Snapchat for business, it’s important to dispel the notion that reach and views are paramount. Applying traditional social media marketing metrics to Snapchat can be very misleading. For now, at least, there is no algorithm deciding who sees your content and who doesn’t on Snapchat. It’s much more old school and based on everyday average people recommending you to other everyday average people. If you want to expand your reach, it’s important to form quality relationships with others on the platform, engage with their content, and post valuable content yourself. Snapchat is built on relationships. Engagement levels and real connections are far more valuable than reach or views. Snapchat is great for professional networking. It helps bridge the gap between your personal and professional life. Snapchat growth starts with creating quality content, traditional metrics don’t apply. Thanks Erica for taking the time to answer our questions and for sharing your insightful tips with us. To catch up with Erica you add her on Snapchat by scanning the Snapcode or joining Snapchat Marketing Mastermind on Facebook.